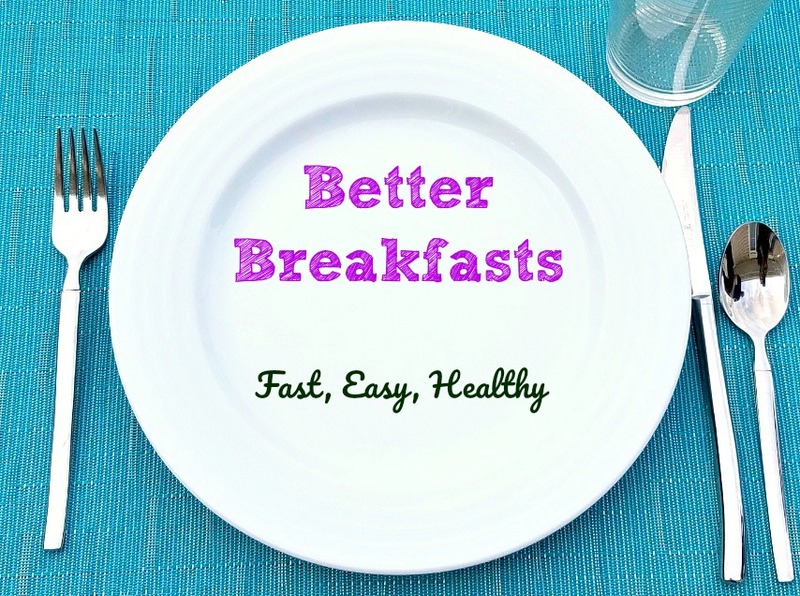 Two secrets for a better breakfast. Foods with power-packed nutrients that stick with you and keep you operating at peak performance all day. Easy and fast to fix. Since September if Better Breakfast Month, it’s time to dispel the myth that healthy breakfasts are time-consuming. Nope, I think there are so many fast and healthy options, there aren’t enough days in the week to enjoy them all! 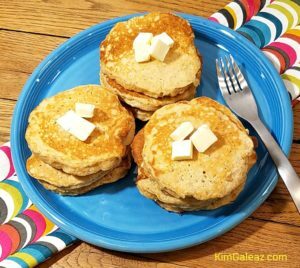 Freeze pancakes and waffles, then just microwave for a fast, easy and healthy breakfast. I’ll start with six of my favorite ideas to inspire you to create better breakfasts. 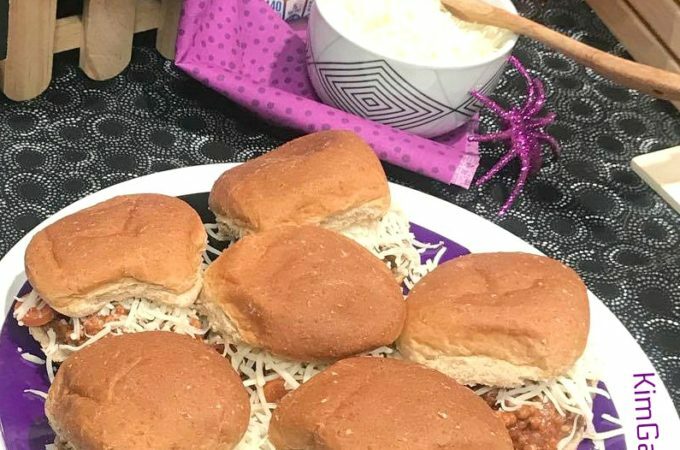 Or if you’re currently a breakfast skipper (like 33 to 51 percent of adults are, depending on which stats you look at), hopefully you’ll realize the benefits of breakfast after a long night of fasting. Adults, teens, kids, toddlers – everyone benefits with first-of-the-day fuel that improves alertness, concentration and overall mental and physical performance. Crack it, fork it, wrap it or stuff it. 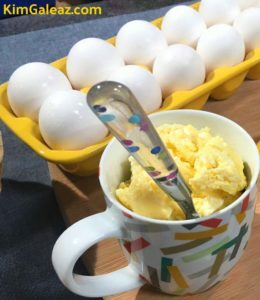 Eggs are perfect for a better breakfast, not just because they provide high-quality protein that helps fill you up (satiety) and keep you mentally and physically energized. They happen to be superfast. In fact, you can microwave scrambled eggs in just under two minutes. Stir two eggs and two tablespoons milk together in a well-greased coffee mug or microwave safe dish. Microwave on high about 30 seconds, then stir and cook for another 60 seconds or so until the eggs are puffed and cooked throughout. 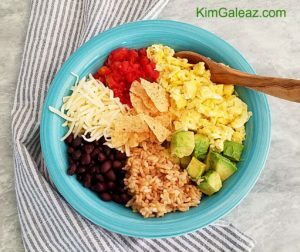 Enjoy straight from the mug/dish, or create a breakfast bowl with some black beans, avocado, diced tomato and shredded cheese. Or stuff or wrap eggs in a pita pocket or flour/corn tortilla along with cheese and Canadian bacon. Just don’t ditch the egg yolk – almost half the egg’s protein is in that yolk along with critical choline plus nutrients for optimal eye health. Three ways with eggs for power and protein-packed better breakfast. 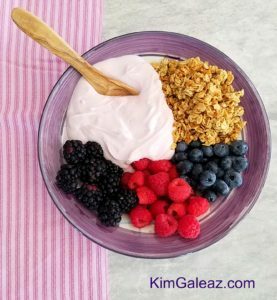 Spoon yogurt in a bowl or parfait glass, add some granola or cereal, even some nuts and chopped fruits. Now, start spooning this power-packed better breakfast. Choose Greek yogurt for more protein, because the latest science shows eating at least 20 to 30 grams protein at every meal – breakfast, lunch and dinners – is crucial for optimal muscle and tissue repair and growth. Weight maintenance and weight loss efforts may be enhanced with more protein at breakfast because you’re fuller and less inclined to mindlessly overeat later on. 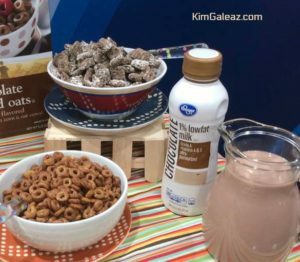 100% whole grain chocolate wheat squares and O’s cereal….with lowfat chocolate milk is a smart, healthy start to your day. Pour some dry cereal in a bowl. Preferably a whole-grain choice, like frosted mini wheat squares, raisin bran, oatmeal squares, cheerios or any other whole-grain cereal. Now pour some milk over it. Stop fretting over sugary cereals and start thinking about the overall benefits. All cereals – even those with moderate to high sugar – provide brain-boosting carbohydrate fuel plus numerous vitamins and minerals (because they’re fortified with over a dozen important vitamins and minerals). Milk adds protein, vitamin D and bone-building calcium. One bowl + cereal + milk = a better breakfast. Just alternate sugary versions with whole-grain versions. My dedicated cereal pantry. I enjoy both whole-grain and sweet versions. Butter is yummy, but that toasted whole wheat bagel, multi-grain English muffin or sliced cinnamon-raisin toast needs more power-packed nutrients for maximum morning energy. Top with almond, peanut or soynut butter for healthy fats plus protein. Add your favorite dried or chopped fresh fruit for additional healthy carbs. 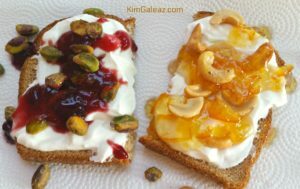 Or try my yogurt-fruit-nut version – toast 100% whole wheat bread, slather with protein-packed Greek yogurt, drizzle with jelly/jam then sprinkle with crunchy pistachios, walnuts, almonds or any favorite nut. Bingo! A better toast breakfast filled with fiber, protein, carbs and healthy fats. 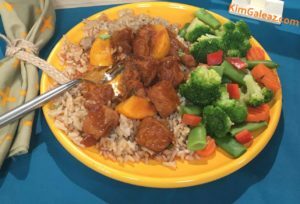 Last night’s peachy pork dish + brown rice + frozen mixed vegetables = power meal for breakfast. Breakfast can be ANY food, even leftovers (LO’s) from last night’s dinner. So start microwaving a plate of that leftover salmon, chicken or pork along with leftover roasted potatoes, rice, beans and/or broccoli. LO’s provide essential protein, carbohydrates and lots of disease-fighting, immune-boosting nutrients for a fast and better breakfast. 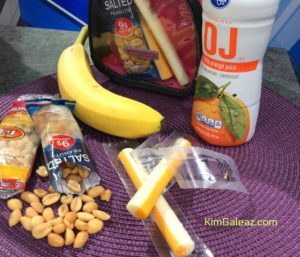 Grab ‘n go breakfast: cheese, OJ and peanuts. 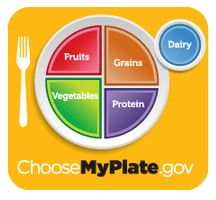 Three nutrient-rich food groups (fruit, dairy and protein). 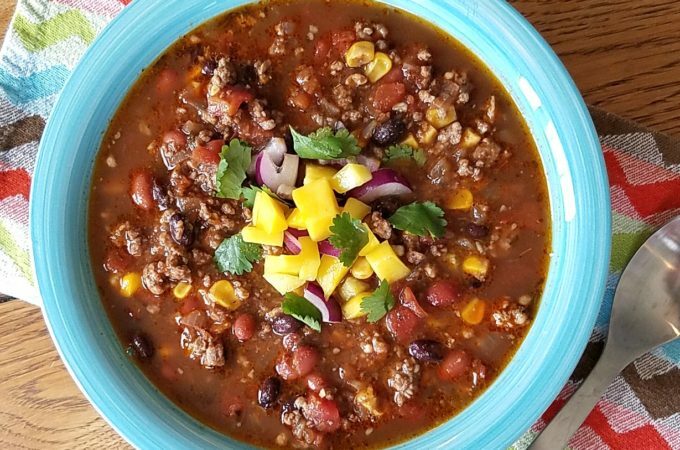 Simply grab three foods from the pantry, fridge and/or freezer. “Think three” means something from three different nutrient-rich food groups. That way you’ll get the necessary kick-start, power-packed nutrients of protein, carbohydrates and fat. A better breakfast. *String cheese, whole wheat crackers, can of vegetable or tomato juice. *Handful of mixed nuts, carton of Greek yogurt, banana. *Cheddar cheese cubes, dried tart cherries or raisins, frosted mini wheat squares cereal in a baggie. *Hard cooked egg, ham slices, multi-grain crackers. *Beef jerky, little pre-packaged containers of mango or peaches in 100% juice or light syrup, chug of low-fat chocolate or strawberry milk. Five nutrient-rich food groups. Aim for choices from 3 of these groups for a smart, fast, easy and healthy breakfast. Disclosure: As a proud supporter of Indiana Agriculture and Farmers, I’m happy to mention this is a sponsored post for The Glass Barn, brought to you by Indiana Soybean Checkoff dollars. All content is created solely by me and all opinions are mine. The Glass Barn is a physical and online resource providing educational materials on Indiana farming and agriculture to educators and students. You can visit the Glass Barn at the Indiana State Fairgrounds all year long.